Choosing a Med-Pass System: Bingo Cards or Strip Packaging? According to a new research study, senior-living communities can save a significant amount of nurse time when they choose to use a strip packaging med-pass system instead of bingo cards for the oral medications nurses administer to long-term-care and post-acute-care residents. Learn how strip packaging allows nurses to perform fewer – and less complicated – steps during med pass. 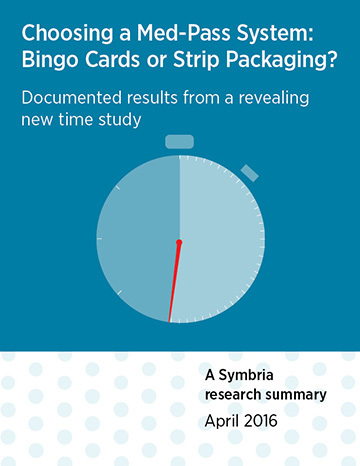 Find out why bingo-card packaging created nearly 19% more interruptions than strip packaging during this study. See how much medication-preparation time your nurses could save per resident with strip packaging. Download this free research summary now to learn how much nurse time strip packaging could save your community. -AlabamaAlaskaArizonaArkansasCaliforniaColoradoConnecticutDelawareFloridaGeorgiaHawaiiIdahoIllinoisIndianaIowaKansasKentuckyLouisianaMaineMarylandMassachusettsMichiganMinnesotaMississippiMissouriMontanaNebraskaNevadaNew HampshireNew JerseyNew MexicoNew YorkNorth CarolinaNorth DakotaOhioOklahomaOregonPennsylvaniaRhode IslandSouth CarolinaSouth DakotaTennesseeTexasUtahVermontVirginiaWashingtonWest VirginiaWisconsinWyoming Please select your state.